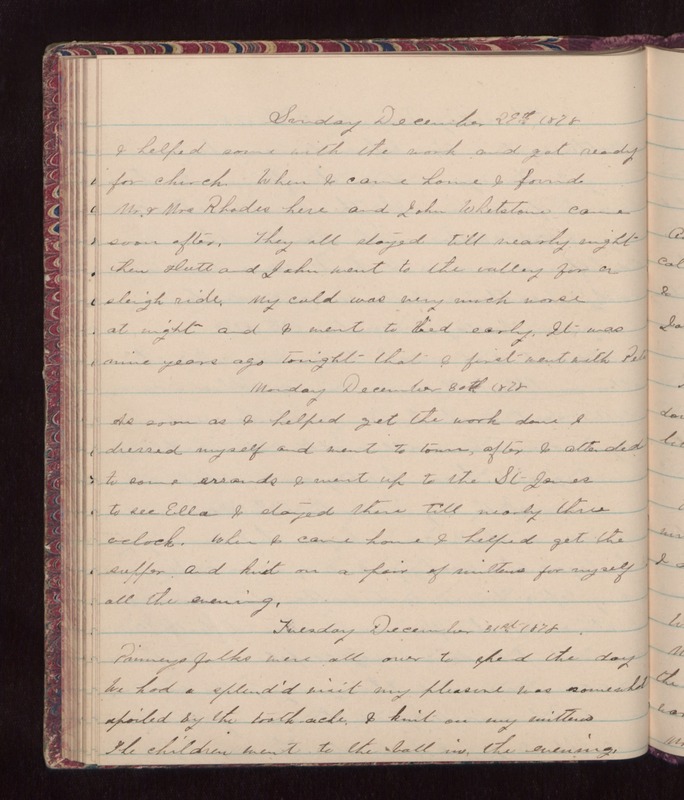 Sunday December 29th 1878 I helped some with the work and got ready for church. When I came home I found Mr & Mrs Rhodes here and John Whetstone came soon after. They all stayed till nearly night. Then Hatt and John went to the valley for a sleigh ride. My cold was very much worse at night and I went to bed early. It was nine years ago tonight that I first went with Peter. Monday December 30th 1878 As soon as I helped get the work done I dressed myself and went to town, after I attended to some errands I went up to the St James to see Ella I stayed there till nearly three oclock. When I came home I helped get the supper and knit on a pair of mittens for myself all the evening. Tuesday December 31st 1878 Pinneys folks were all over to spend the day We had a splendid visit my pleasure was somewhat spoiled by the tooth-ache. I knit on my mittens The children went to the ball in the evening.